Solano History 10 records found Search took 0.01 seconds. BOOK LEARNIN - Vacaville residents cannot say they have been deprived of access to book learning throughout our past history. Events will prove that as far back as 1858 there were attempts made to provide a library service to the few people who resided here. The Women's Christian Temperance Union also had a part in seeking to provide such facilities here. Celebrating July Fourth with a lavish display involving the whole community has a long tradition in Vacaville. School days, good old golden rule days. An estimated 9,000 Vacaville area elementary and high school students will go back to their classes next Tuesday. No one is able to predict whether registrations will be up or down. With home building here at a near stagnant position, there actually could be a decline in registrations for the fall semesters. One day in 1900, representatives of the Steiger Terra Cotta and Pottery Works of San Francisco visited local rancher A.A. Dickie. The Steiger people had learned that Dickie had a rich deposit of lime on his property. It turned out to be a very rich find indeed, the consequence of which a company was formed, called the Eureka Portland Cement Co.
As part of the Fairfield's 2003 Centennial Celebration, the City commissioned a documentary video of Fairfield's history. 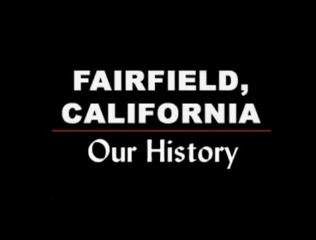 The video highlights significant events and projects that shaped present day Fairfield. Numerous current and past employees, long-time residents, and local Solano County historians were either featured in the video or provided documents and pictures for the project..
Memoirs often provide valuable insight about the past that may seem of little importance when an individual first writes them. Today, with the last remains of the old company town of Cement rapidly disappearing under the onslaught of new development, a way of life is also being relegated to the dusty archives of history to be remembered only in the minds of a few old-timers and people who enjoy learning about the past. LET'S TALK INFLATION - If you noted the following prices in today's newspaper, you would know someone was out on a lark and wanting to have some fun. But, these prices actually appeared in advertisements in The Reporter back in 1932: pound of coffee 19c, loaf of bread 10c, pound of beef stew 9c, pound of bacon 14c, fresh pumpkin pie 15c, head of lettuce 4c, can of olives 9c, pound of butter 22c, bunch of vegetables 2c, a pack of cigarettes 10c, and you could send Junior to the Vacaville Theatre for 10c. That all added up to $1.24. Present day shoppers for all sorts of merchandise are enticed by sales promotions and advertisements unheard of sixty or seventy years ago. During several of the Solano County Historical Society meetings to save the old Fairfield Library building, some of those in attendance from Vallejo expressed continuing anger over the razing of the Vallejo Carnegie Library building.